Some people confuse the Immaculate Conception with the Virgin Birth. However, they are two entirely different events. The Immaculate Conception refers to Mary's Conception in her Mother's womb - she was conceived without the stain of Original Sin - the only person ever (apart from Jesus) to be conceived in that state. 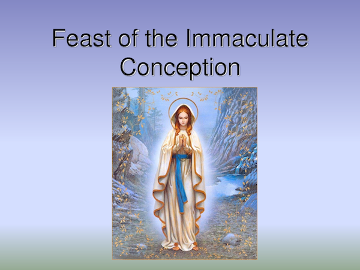 The Immaculate Conception is celebrated on December 8th, and nine months later we celebrate Our Lady's Birthday (8th. September). The Feast day of the Annunciation, which is when Mary became pregnant carrying Jesus, is celebrated on March 25th and nine months later is Jesus's Birthday (25th December). John the Baptist was born without the stain of Original Sin on his soul, but at conception he bore that stain, and it was removed by Jesus (who was in His mother's womb) at the Visitation (the second of the Joyful Mysteries of the Rosary). Belief in the Immaculate Conception of Mary was widespread for many centuries, in both the East and the West. On December 8th 1854, the doctrine was defined by Pope Pius IX. How great must have been his emotion when he learned just four years later that Our Lady had appeared at Lourdes to Bernadette Soubirous, and identified herself as "The Immaculate Conception".